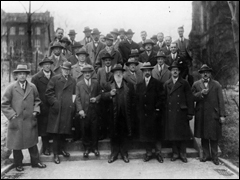 The first meeting of the Society of Experimental Psychologists - then called "The Experimental Psychologists", or "The Experimentalists" for short - was held at Cornell University in Ithaca, New York, on April 4 - 5, 1904. The meetings then, and for many years thereafter, were presided over by Edward Bradford Titchener. Researchers from universities including Cornell, Yale, Clark, Michigan, and Princeton attended these early meetings, with Chicago and Iowa soon joining. Research papers were read and discussed by established researchers and tyros alike. As the number of practicing experimental psychologists grew nationally, along grew discussions concerning the limits that should be placed on membership in the group: Should it be kept small to ensure a manageable series of conferences; or should it be open to all interested, practicing experimental psychologists? The decision was made to keep it small-to follow the so-called Academy model-and eventually Fellows of the society founded an alternative organization, called The Psychonomic Society, to serve the needs of broader representation and communication. During these early years, the total membership in the Experimentalists ranged around 35 individuals. In 1929 the Experimental Psychologists were reorganized as the Society of Experimental Psychologists (or SEP). After the reorganization, the Society grew in numbers and diversity of experimental interest. The meetings were kept small and brief, just one and half days of sessions, and continued their emphases on communication of ongoing research and the open exchange of ideas among active researchers. In the original bylaws of 1929, the purpose of the Society was stated simply as follows: "To advance Psychology by arranging informal conferences on experimental methodology." Methodology had been an important focus of the Experimentalists, where visits to laboratories and the demonstration of equipment during meetings were actively encouraged. As the Society's evolved interest in methodology waned, it was replaced by interest in theory and data. The Society of Experimental Psychologist has never been an activist organization; it is not part of Federations, nor does it advertise its meetings. In 1943 - and again in 2001 - there was talk of a possible affiliation with the American Psychological Association or the American Psychological Society. The Society now envisages a co-location of its meetings with those of another major psychological conference. Its priorities remain focused, however, on the informal atmosphere associated with the meetings hosted in Psychology departments. The major officers of the Society, who constitute the Executive Committee, include: the Chair, who is responsible for the arrangements of the meeting that year; the Secretary/Treasurer, who maintains flow of information and husbands the budget of the Society; and two additional board members. There is a staggered rotation of the board members, with terms lasting for 3 years, except for the Chair's position, which rotates every year. The activities of the Society are organized primarily around the annual spring meeting, which features presentations lasting 20-30 minutes. 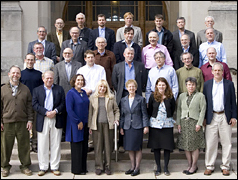 The Society also maintains a LISTSERV for communications among members and initiated a web site in 2002 (www.sepsych.org) . Other activities include the conferral of honors on members of the Society or other individuals. The two major honors are the Warren Medal and the Lifetime Achievement Award. The Warren Medal, bestowed since 1936, was endowed by the widow of Howard Crosby Warren to honor the life of that exceptional psychologist. The Warren Medal is awarded for "outstanding work in experimental psychology" with a focus on work published during the prior 5 years. The Lifetime Achievement Award was initiated in 2002 and recognizes exceptional contributions over a longer time-span than the Warren Medal. The current membership comprises about 230 individuals with expertise in areas including experimental, cognitive, perceptual, behavioral, developmental, and social psychology, and neuroscience. This number constitutes approximately 8% of the membership of the Psychonomic Society, a proportion that has remained relatively constant over the last 40 years.